This print shows Taira no Kiyomori (1118-1181), the head of the Taira warrior clan that established the first samurai government in Japan. His exploits became one of the subjects of the warrior epic, The Tale of the Heike . 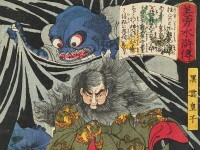 Depicted here is a famous episode in which the dying Kiyomori, suffering from a hallucinatory fever, is haunted by a vision of all the enemies he has murdered during his military campaigns.